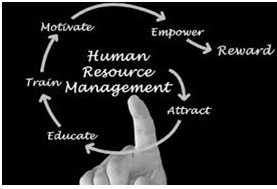 Human Resource Management refers to all practices adopted by the companies to acquire, develop and retain the employees. It helps organization achieve its goals by increasing productivity of the employees. "Human resource management is a process consisting of four functions- acquisition, development, motivation and maintenance of human resources." "Human resource management refers to the policies and practices one needs to carry out the people or human resource aspects of management position including recruiting, screening, training, rewarding and appraising." "Human resource management is a process concerned with the management of human energies and competencies for achieving organizational goals through acquisition, development, utilization and maintenance of a competent and committed workforce in a changing environment." "Planning, organizing, directing, controlling of procurement, development, compensation, integration, maintenance and separation of human resources to the end that individual, organizational and social objectives are achieved."